Bake a two layer 10" square cake. Make an ivory buttercream icing . Ice the cake between the layers, then the sides, and finally the top. Make sure it is nice and smooth. 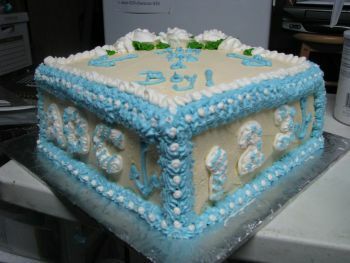 Now make a light blue icing and using the star tip #16 pipe stars along the top edge and side edges of the cake. Do the same with the corners of the cake. Make a single row of stars along the bottom edge of the cake. With the round tip #5 and white icing make small dots in the center of the blue borders. Using white white icing and the #5 round tip outline A B C on one side of the cake. On the next side outline the numbers 1 2 3. The next side outline A B C, and the fourth side outline the numbers 1 2 3. With the star tip #16 fill in all the letters and numbers with white icing. Using the blue icing and the round tip #4 make designs on the letters and numbers, like lines , dots and zig zag lines. Next use your white icing and rose tip # 125 and make a ruffle on the edge of the blue icing border on the top of the cake by using a zig zag motion. Make a white rose with rose tip #125 and place it in the top back corner. Make 3 more roses and place them in front of the rose in the corner. Make a green icing and use leaf tip #352 and make leaves around the roses. Now use the blue icing and round tip #5 and write , from the rose corner to the opposite corner , Ahoy It's a Boy. putting only one word on each line. With the same icing and tip make an anchor on each side of the writing and on each side of the cake after the letters or numbers.